Ancillary Justice is a Hugo nominee, has already won the Arthur C. Clarke Award, and has been almost universally well reviewed–by The Guardian and Strange Horizons, among others. The book has its virtues. It’s better written than average. It also brings up the thorny matters of what soldiers should do when ordered to commit war crimes, and the psychological after effects of committing such crimes. These are matters rarely addressed in science fiction, and Leckie deserves plaudits for doing so. One thing the reviewers seem to have missed, though, is that Ancillary Justice is essentially a fantasy novel in science-fiction guise. It’s very easy to imagine its action taking place in a standard medieval-magical setting. Reviewers seem to have overlooked this because the book is set in the far future where science and technology are so advanced, as Clarke famously remarked, as to be indistinguishable from magic. However, there’s nothing in the book that demands a far-future setting and, in the few places where Leckie does touch on science/technology, she seems not to understand it–for instance, apparently she doesn’t know that standard projectile firearms will always fire as readily in vacuum as they do in air; in the same scene she inadvertently reveals another misperception: she has the person firing single shots be afraid their weapon will overheat (in the cold of space); and in one chapter she mentions (to paraphrase her) vacuum-adapted lungs. 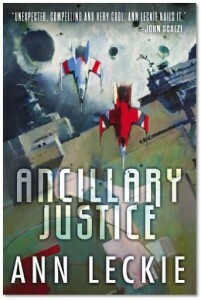 The background of Ancillary Justice is the ruthless Radch empire, ruled over by a tyrant with its intelligence distributed through thousands of “ancillaries,” humans whose minds have been wiped and then taken over by the tyrant, all of whom are consciously connected, and who can still function as independent parts (with the tyrant’s identity) should that connection be broken. The AI’s running the empire’s warships also have ancillaries, though individual ships have fewer. This concept is not particularly new–Matt Somers uses a similar concept in his later Avery Cates novels–though the idea of using brain-wiped humans rather than clones is unusual. The concept that the tyrant’s continuously connected ancillaries could work at drastic cross purposes on a large scale for centuries without being aware of it is also novel, but is hard to buy. Whether all this is necessarily in the science fiction realm is doubtful. If you judge by the trappings, yes, but if you judge by the concepts, no. Queens and warriors with magical power to take over the minds of others would work just as well, probably better, in fantasy. The plot revolves around a ship’s ancillary, Breq, who is forced to take part in atrocities and who after the ship, Justice of Toren, is destroyed, goes on a quest to find a magic gun (there’s really no other term for it) that will allow her to kill as many instances of the tyrant ancillaries as possible and expose to those continuously connected ancillaries–who apparently have a severe case of multiple-personality disorder–their cross purposes. As for the social and political background, the novel aspects are the book’s treatments of committing criminal acts under coercion and the psychological after effects of doing so. Other than that, Ancillary Justice could just as well be set in the Middle Ages. Politically and socially, there’s nothing new about ruthless, expansionist empires ruled by tyrants, with hereditary privileged classes and vassals (“clients”), and formalized terms of address and interaction. On the purely social level, there’s not much new here except that Radch citizens must wear gloves at all times, and are obsessed with drinking tea. (The word “tea” appears several hundred times in the novel’s under-400 pages.) All of this is more suited to fantasy than science fiction. One genuinely unusual aspect of Ancillary Justice is the author’s use of feminine personal pronouns to refer to everyone, male or female. If she’s trying to make the point that English defaults to masculine personal pronouns, fine. But this is a heavy handed way of doing it. It also seems that the author is trying to make the point that all personality distinctions between men and women are the result of nurture rather than nature, which is a throwback to the 1970s and 1980s, when that concept was popular. (I bought it myself. There’s been a lot of psychological and sociological research since then that indicates some differences are the result of culture and others are innate.) The author does seem to tailor her characters to this discredited all-nurture premise. There are no differences at all between biological males and females in Ancillary Justice, and Leckie rarely reveals the gender of characters; she doesn’t even do it in the case of Breq, the novel’s narrator and protagonist. Here, rather than exploring this complex topic, Leckie has instead slapped one-size-fits-all pronouns on all of her characters and otherwise ignored the matter. This doesn’t do the job. It’s a way of avoiding the job. While Ancillary Justice has its strong points, its deficiencies far outweigh them . Not recommended. Reviewer Zeke Teflon is the author of Free Radicals: A Novel of Utopia and Dystopia. He’s currently working on the sequel.